Alt-A is another classification of mortgages that's going to be a problem sooner rather than later. Alt-A loans were marketed as slightly riskier loans than prime borrowers, but safer than subprime loans. The irony is that subprime loans went to borrowers with bad credit histories, but decent colateral and an ability to pay. Alt-A, the supposedly "safer" loans, went to borrowers with good credit scores, but limited collateral and suspect abilities to repay. "Like the subprime loans that began imploding in 2006, these Alt-A loans offered seductively low introductory payments that enabled many borrowers to buy or refinance homes that were pricier than they could otherwise afford. Now, those borrowers increasingly are discovering the true cost of their loans. When the introductory period ends, monthly payments can jump 50 percent or more on the typical Alt-A loan, far higher than many borrowers can afford. Today, there are 18,000 Alt-A mortgages in Sonoma County. They account for about 18 percent of the county’s 102,000 home mortgages — triple the U.S. average, according to First American CoreLogic, a real estate research company. It is a far larger share of the county’s real estate holdings than subprime loans, which accounted for about 10 percent of local mortgages at their peak five years ago." So consider that bit of news - 18% of Sonoma County loans are Alt-A and subject to rising payments as the economy falters, while just 10% of their loans were sub-prime. "Alt-A was and has always been about maximizing consumption. If subprime was supposed to be about taking a bad-credit borrower and working him back into a good-credit borrower, Alt-A was about taking a good-credit borrower and loading him up with enough debt to make him eventually subprime." I found this story interesting - Black Swan Fund Makes Big Bet on Inflation. Anyone that was up 100% in their hedge fund last year (while global markets were crashing) is worth listening to and these guys have a pretty serious following right now. Their bet is that the fight to reflate the global economy will lead to sharply higher inflation in the coming years. I'm not in that camp, probably as much out of fear for what that really means for all of us if this is true, but it's worth noting that many smart people have recently begun playing the inflation trade (selling US Dollars, Treasuries, buying gold, oil, and other commodities). Finally, I'd also note that the hottest hedge funds rarely stay hot. It's not an implication of this fund's ability, it's merely an observation that most hedge funds have a day or two in the sun before another strategy suddenly becomes the hot new thing. I've alluded to my expectations for the economy, commodities and stock market but I thought it might make sense to put some actual numbers down on the web so that I have a point of reference to review at this time next year. 1) The economy: It's really struggling. For all of the talk of green shoots, stimulus, etc. the reality on the ground is that business has taken another leg down in the second quarter. Unemployment is probably north of 9% and looks like it's screaming toward double digits. The auto sector is going to weigh heavily on many regional economies. I don't really see any light at the end of the tunnel on the economy. 2) The market: This is where there is a disconnect. The markets continue to rally in the face of bad news and I think there is a better than even chance that we climb the wall of worry higher for some time. Falling treasury prices will help the stock market (and hurt the taxpayer, but that's another story:)) and investors are getting antsy. Many that have sat on the sidelines through the rally and there is a fear of looking like an underperformer. Ultimately, the economy - lost jobs, falling revenues, more foreclosures, more bank failures, more commercial real estate busts, etc - will take the stock market back down and it's possible that we revisit our 2009 lows (and possibly break beneath them). The timing of when this happens 2009 or 2010 is difficult to say, but this is my current thinking. 3) Oil, etc -- Oil is the commodity that you interact with the most unless you're buying copper tubing to redo a house. Oil is starting to feel pretty comfortable in the mid-sixties and it has three big things working in it's favor - the US summer driving season is coming up, the US dollar may struggle, traders are moving back into oil. Since, we don't live in one of those tax friendly states, we're already paying $2.65/gallon and I expect we'll see $3.00 before Labor Day. Ultimately, demand for oil is low (unless China drains a couple of lakes to fill them with oil) so I think we'll see prices retreat - assuming there are no major hurricanes - before making another move up in 2012. Disclaimer - this is little more than a collection of educated guesses - much like the weather forecaster that predicts 10mph NW winds that turns into a 44mph gale that sinks my dock for the 3rd time this year Grrrr!!! - many of my guestimates will prove wrong. Perhaps wildly wrong. Only time will tell. What an amazing run it's been for the US auto industry. The first model T's rolled off the assembly line in Detroit in October 1908. Roughly 100 years later, an industry built on innovation and cheap petroleum is suffering as both GM and Chrysler are going through bankruptcy (presumably GM will file on Monday). While the markets might cheer this and some people are foolishly still trading GM's stock, a couple of things are clear. The pain that this bankruptcy will cause will be severe but probably not severe enough. Dealers are being cut from both Chrysler and GM, these dealers are drastically lowering prices to blow out inventory. The result is that normal demand for vehicles that might have shown up in 2010 or 2011 is being pulled forward. I think that by trying to soften the pain of a GM bankruptcy we've actually made things worse for GM in the future. Unfortunately, for you and I, we are going to be the primary losers in this scenario because we own GM. There have been some serious cracks showing in the treasury market (this is where the government sells our debt). Here's a quick, overly simplistic view of the treasury market - when treasury prices dip, interest rates rise. Why does this matter to Joe the Plumber? For one, the higher the interest rate the government has to pay, the more taxes you are ultimately going to be liable for - notice on the US debt clock that INTEREST is over $100 billion already this year. The second and more immediate impact is on mortgage rates. Mortgage rates are based on the interest rate on the 10 year note. This interest rate has gone vertical in the past couple of days and mortgage rates have soared closing in on their highest levels of 2009. The mortgage market has seized up as a result and is likely to hamper any meaningful rebound in housing. As I noted yesterday [see Mortgage Market Locks Up], a rate spike this large results in chaos. Weeks/months of purchase and refi loan applications will be lost. Mortgage operations centers are parsing through thousands of loans focusing only on locked loans and purchases mitigating potential losses. The rest are dead wood. Rates are all over the map as lenders assess the damage and price cautiously. Now, it is a mad dash to only focus upon the loans that are locked and have a chance of funding. If the locked loans are not funded quickly and the interest rate complex continues to experience this extreme of volatility, serious losses can occur. In a nutshell, they are kicking aside everything that is not locked or not a purchase in contract." "Saudi Arabia warned oil prices could spike to beyond the near $150 record high of 2008 within two to three years. Energy ministers and officials at the Group of Eight energy summit in Rome are meeting as oil prices hover at a six-month high of over $60 a barrel, but below the $75 a barrel level producers say is needed to spur investment in new production. Saudi Arabian Oil Minister Ali al-Naimi said the world was heading for a fresh spike after the current phase of faltering demand and lower prices, which reflected the global economic downturn rather than an indicator of things to come. "However, if others do not begin to invest similarly in new capacity expansion projects, we could see within two-to-three years another price spike similar to or worse than what we witnessed in 2008." Admittedly, Saudi Arabia has a vested interest in talking up oil prices, but I tend to agree with the premise that even if the US remains stuck in economic quicksand for the next 10 years, Chinese and Indian demand is likely to spur higher prices and we are not addressing the issue because gas is still under $3/gallon. If you pull up to the pump in 2012 and gas is $6.25/gallon you might want to question why we didn't address the situation when we had the chance. If not, you might have missed the boat. Refinancing isn't for everyone because it resets your payment clock - ie, if you've paid 8 yrs on a 30yr mortgage, you're 22 years to owning your house free and clear, but if you refi, now you're facing another 30 years of payments (unless you refi into a 15 yr). The Federal Reserve made a conscious decision to lower mortgage rates by buying US treasuries in an effort to stimulate refinancing and home buying. It seems to have worked for awhile as mortgage rates plunged below 5% in April. However, there has been a steep jump in long-term interest rates in the past week and 30yr mortgages have climbed from 4.85% to 5.1% in the past couple of weeks. That doesn't sound like much, but that move increases the monthly payment by $20/mth or $7,200 over the course of a 30 year mortgage on a $150,000 loan. If rates continue to move up (there is evidence that regionally rates are already north of 6%), this could sharply curtail the recent run on low-end housing. Admittedly, you would expect the percentage of payroll growth to slow over time as the nations population has grown. 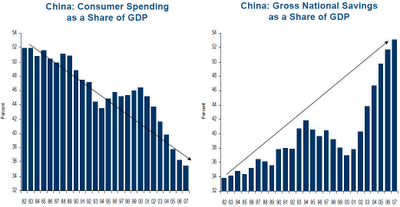 However, the drop from 20% growth in the 80s and 90s to just 1% growth in the current decade is startling. For all the talk of green shoots, you can't grow the economy without jobs. I'd also argue that the quality of the jobs created in the last nine years has been far below that of past decades. Many new jobs were "created" in low-end service and retail, while higher wage manufacturing and service jobs were lost. You could argue that the rise in undocumented workers might account for some of this decline as well. That's probably a fair argument, but it doesn't change the fact that payrolls are flat to declining and that means tax revenues are flat to declining for the foreseeable future. We also got a glimpse into the future as initial unemployment claims dropped slightly (but were revised higher for last week). As continuing claims race toward 7 million people I think the odds of 10%+ unemployment continues to increase. The markets seem to be happy today with the durable goods data which was surprisingly strong. However, the Non-defense/ex-aircraft durable goods number actually fell again this month (indicating government spending was the main factor propping up orders). If the market gets a rally going watch the 10am new home sales number. This is a practically meaningless number when compared to existing home sales, but some times the cheerleaders at CNBC like to pump it up. Wow - N. Korea tests a nuclear weapon, housing prices plummet to record lows and then wham - consumer confidence soars and the markets resume rally mode. Unfortunately, as we seen with most of the "getting worse, just more slowly" news stories, the soaring consumer confidence was driven entirely by consumers "expectations" that things will improve. In fact, the present conditions component of the survey barely budged and remained at a dismal 28.9. The expectations component of the survey surged to a whopping 72.3, it's highest level since December 2007. Hmmm, let's try to remember way back then....... the Dow was at 13,625 and consumers were expecting very good times ahead. How exactly did that play out? Again, this data set can be self-fulfilling - strong stocks drive confidence which drives stocks which drive confidence, etc... - and we could get more data like this during the week with housing data. Housing remains in the dumps, but the housing data counts a foreclosure sale the same as a traditional sale so the data could continue to fool the market. Consumer Confidence or Consumer Hope? They call it "consumer confidence," but the numbers released Tuesday by the Conference Board might better be pegged as "consumer hope." "There's a big difference, namely that confidence translates into spending, while hope is just a good feeling. The Conference Board's measure of consumer confidence was up 35% from April, the fourth-largest jump in the 32-year history of the index. The move left consumer confidence in positive territory at 54.9, the highest it has been in eight months. The gain was far bigger than economists expected. Consider that there was a big increase in the percentage of consumers expecting the economy to generate new jobs, despite no evidence that the current economy can actually achieve that. Consumers ignore possible problems when they are feeling good, but the true measure of consumer confidence ultimately is reflected in consumer spending. Any positive move in confidence now won't be reflected in those numbers until late summer. " Someone wittier than myself said that visiting www.usdebtclock.org was like financial water boarding for the fiscally sane. The numbers are all pretty numbing, but consider that last April our total debt was $9.2 trillion - we've added $2.1 TRILLION to our debt load in the last 13 months. 18.6% of the entire debt that our nation has assumed in our 240+ years history has been lumped on our balance sheet in the past 13 months!!! I'm sure that will end well. "About $1.4 trillion in real estate debt is set to mature over the next four years, with some $204 billion coming due this year alone. Most of that debt won't be able to be refinanced or restructured because lending standards have tightened and commercial real estate values have cratered since last year, according to Deutsche Bank analyst Richard Parkus. However, this commercial real estate crisis, fueled primarily by developers and property investors getting easy access to relatively cheap loans, may be even worse than what's come before. That's especially the case since Average Joes and Janes are by extension huge landlords via pensions, endowments and mutual funds -- which have big commercial property exposure over the past few years. " Keep that in mind the next time you hear about a massive building going belly-up in NYC, Boston, Vegas or Miami. That might be a part of your retirement going bust as well. This week we're faced with a number of housing data points - Case Shiller index at 9am tomorrow, Consumer confidence at 10am tomorrow, existing home sales 10am Wednesday and new home sales 10am Thursday. Existing home sales is the biggest number in the set, but expect them to all be treated the same by the markets. The expectations are for existing home sales to tick up slightly again in April. I'd agree that there has been some activity on the very low end of the real estate market and this data set treats all home sales the same (a $5,000 teardown in Detroit is counted the same as a $790,000 split ranch in Connecticut). That makes the data flawed, but you work with the info that's presented. "Real estate got just about everyone into trouble in Phoenix, and the thinking seems to be that real estate is going to get everyone out. The low end of the real estate market here — and in some equally hard-hit places like inland California and coastal Florida — is becoming as wild as anything during the boom. One real estate agent was showing a foreclosed house to a prospective client when a passer-by saw the open door, came in and snapped up the property. Another agent says she was having the lock changed on a bank-owned home when a man happened by, found out from the locksmith that it was available, and immediately bought it." 1) The sale of a foreclosed home is not like the sale of a home in the good old days. If first time homebuyer A, buys a house from seller B, seller B now needs a house. Seller B, buys from C, C from D, etc, etc.... This cycle leads to lots of increased economic activity - realtor fees, landscaping, contractors, etc. Consider a foreclosure sale: first time homebuyer A buys a house from the bank. The bank shoves the money into a big box and buries it in the back yard. No further economic activity beyond a single transaction. 2) Those sellers that are able to sell today are increasingly likely to sell at a loss.
" In the first three months of this year, 62 percent of local home sellers accepted less than they paid for their homes, in part because aggressively priced foreclosures have dragged down prices around the region." "In the Virginia and Maryland suburbs, prices for single-family homes are down to where they were five years ago. In Prince William and Loudoun counties, a flood of foreclosures has pushed prices so low that bargain hunters have flocked there in recent months, helping to boost sales. But while in past slumps a surge in sales has signaled the start of a rebound, this downturn is unlike any in recent times and it's premature to call a recovery, said Barry Merchant, senior housing policy analyst at the Virginia Housing Development Authority. The encouraging signs have been offset by more troublesome ones, he said. After tapering off for a few months, foreclosures in Northern Virginia are starting to creep up again and may keep climbing now that several lenders have lifted foreclosure moratoriums. "If sales are not increasing and foreclosures are on the uptick, then the question is: 'Is there another shoe to fall?' " Merchant said. "Maybe what we were hoping was the bottom was just a bump on the way down." Finally, there was this bit of news today that Job losses have pushed safe loans toward foreclosure. The next time you hear someone shouting from the rafters how the Fed Chairman has seen some more green shoots or how the consensus thinks this or that, keep this video in mind. Of course, this is a bit unfair to have clipped together just all of the forecasts that Chairman Bernanke got wrong, but it's still pretty telling just how wrong the Fed has been with their near-term forecasts. 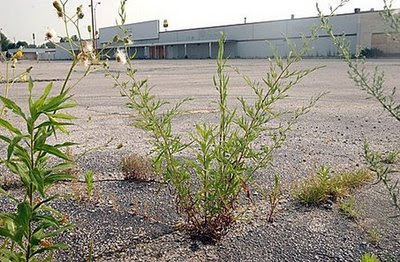 So this is what Bernanke meant by "green shoots" - weeds popping up at the mall. Seriously, another powerful rally on light volume. This was the trend over much of the last few months gap open and then someone buys the market on every dip. I don't know who is buying right now - you can argue that stocks are not only not cheap, they are in effect the most expensive that they have EVER been. I still think the rally is getting tired, but a few more days like this and we'll push through to new technical levels. I spent most of today trying to deal with my new addiction - www.skygrid.com. It's a terrible web name with a great product. This is the future of online news - it's a drudge/bloomberg/WSJ/FT/NYT killer. You can't get on the site without an invite, but I imagine they'll come out of beta soon. When they do I'll let you know. Basically, it's scrolling news from all of the major media outlets with short summaries and a visual interpretation (a green light = a positive story, a red light = a negative story). 1. Almost everyone has noticed the recent run-up at the pump. Nationwide gas prices have jumped 25cents in the past three weeks. What's going on? Well, demand for crude remains weak but the US dollar has weakened by about 3% in the past few weeks (remember as our $ weakens, the cost of oil to us increases), traders seem to be positioning for another sell stocks/buy commodities run and global oil buyers seem to be filling up there storage facilities. "As tank farms on land fill up and ships lie idle as a result of the recession, a growing number of vessels are being pressed into service as "floating storage". Analyst estimates suggest another 100-120 million barrels of crude is being stored on vessels moored in the Persian Gulf, off the coast of Singapore, and at other locations around the world." Eventually, all of this excess oil will hit the market and it might create a pretty substantial oil glut if it all hits the market at once. The long-term trend is probably still up for oil, but that trend is going to be put to the test by the vast amounts of oil being stored around the world. There's a pretty good satellite mash-up showing the moored vessels outside of the Port of Singapore online here. Let's consider for a moment that the last two owners of Chrysler - Mercedes and Cerebus (a hedge fund) couldn't make the Chrysler brands profitable, but somehow the UAW, Fiat and the US Government will be able to make it work? "U.S. credit card defaults rose in April to record highs, with Citigroup and Wells Fargo posting double digit loss rates, as the recession slashed more than 2 million jobs since the beginning of the year. But the latest numbers dashed hopes of an early recovery, according to reports on the performance of credit card loans that issuers packaged into bonds and sold to investors. "April, in our opinion, still bears some beneficial trickle effect of tax refunds received by customers and therefore is seasonally a relatively better month," Scott Valentin, an analyst at FBR, said in a research note, suggesting a grimmer outlook for the industry in coming months." Asian markets are off to a really rough start, down 2-3% right now, we'll see if that carries over into Europe and the US markets tomorrow. The concept of a cash for clunker plan can be a good one. Give a consumer a financial incentive to trade in their gas guzzler for a more efficient vehicle - the consumer wins, the environment wins and the free market takes a little jab on the chin. However, as currently constructed this plan looks like it was written by either the CEO of Hummer or by a bureaucrat that really wants to give away taxpayer dollars. To qualify for a $4,500 voucher if you are replacing a passenger car, you would have to buy a new passenger car which gets 22 mpg and gets at least 10 mpg more than your old car. Sounds good enough. To qualify for a $4,500 voucher if you are replacing a large light duty truck, you would have to buy a new truck that gets an AMAZING 15 MPG and gets AT LEAST 2 MPG more than you old truck. If your old truck achieved 13 MPG and you drove 10,000 miles per year you'd burn through 769 gallons of gas/year. If you take advantage of the cash for clunker voucher and upgrade to a truck getting 15 MPG you now use just 667 gallons of gas. You'd save over 102 gallons of gas per year. Even at $3 gas, it would take almost 15 years to realize $4,500 in savings from this clunker of a program. Thankfully this program is still being formed. Hopefully, someone will make the adjustments to make this program a valuable shift in policy rather than just another handout to the auto industry. First, I saw a 46" spawing Muskie swim under my dock and then the markets go haywire. For the past week, the markets had been looking tired. It seemed as if every time someone said "Yeah, it's bad, but better than expected :)" the chorus of groans grew louder. Finally, with the stress tests behind us it appears as though the data is once again turning and that made everyone nervous. Retail sales were sufficiently bad to scare everyone. What I found particularly interesting was the fact that gasoline sales were down another 2.3% after falling 3.2% in March in the face of rising prices. This implies that gas volumes are off even more substantially. When retail sales "jumped" in January, I noted that it was mostly due to higher gas prices. Today higher gas prices aren't able to offset lower demand. At some point Walmart will probably come out and trumpet the strength of their business. Don't misread that info - strength at Walmart does not equal strength in the US economy. In fact, I think you could argue that the opposite is true - when the going gets tough, the tough go to Walmart :). I think I mentioned on Friday that we were setting up for a pretty significant pullback. I'm not sure if this is the start of that pullback but technically if the S&P 500 falls another 18 points or so there is a giant gap in the chart to much lower levels. As someone engaged in the financial industry I was stunned by the trial balloon floated by the Obama Administration today. "Obama administration officials are contemplating a major overhaul of the compensation practices in the financial services industry, moving beyond banks to include more loosely regulated hedge funds and private equity firms." There is sufficient public animosity toward the financial industry that some form of compensation oversight could get passed. This would be another nail in the coffin of the US Financial Services sector. I can trade S&P futures just as easily on a beach in Goa as I can in NYC. A number of large investors have already started the migration east toward emerging markets and a move to limit compensation or make that compensation public, might send the money men in Greenwich and NYC scurrying like snakes from Ireland. Unfortunately, they'll be taking their large tax payments and substantial economic impact with them. The unfortunate result of the current auto industry crisis is that dealer networks are going to shrink dramatically. While this is a healthy development for the future of the industry it's going to be a painful adjustment as many people lose their jobs and empty car lots start to dot the landscape. According to bloomberg GM will notify 1,000 dealers of their franchise expiration on May 15th. "General Motors Corp., working to shrink operations to match consumer demand, will notify 1,000 to 1,200 auto dealers on May 15 that they fail to meet franchise agreements. GM will deliver letters to dealers whose stores fail to meet criteria such as sufficient working capital, sales or customer-satisfaction levels, explaining that GM will not renew their franchise agreements when they expire this year or in 2010, GM spokeswoman Susan Garontakos said. The largest U.S. automaker said last month it plans to shrink its dealer network to about 3,600 from the 6,200 outlets." Also, it sounds like Chrysler is making a similar moves as early as tomorrow. "Chrysler LLC plans to fire up to 800 of its 3,200 dealers on Thursday, a lawyer seeking to represent the dealers said on a conference call. The lawyer, Stephen Lerner, who heads the bankruptcy and restructuring practice of the law firm Squire Sanders, told dealers on the Tuesday call that the automaker plans to reject at least 800 franchise agreements, according to a dealer who listened to the call." The markets seem to be struggling a bit under the weight of bad data. Housing prices down, Chinese Industrial production below expectations, below expectation retail sales, and ANOTHER bottom call from Alan Greenspan on housing. Mr. Greenspan has been calling for a bottom in housing for about 3 years now. Eventually, he'll be right. It's a little early to start being concerned about gas prices as they are still solidly in the $2.30-$2.40 range across much of NYS. However, it's important to note that in my opinion two of biggest factors that drove oil prices from $80 per barrel to $145 per barrel were traders chasing a momentum play and weakness in the US dollar. Oil prices crossed $60 yesterday, its highest level since November. The US dollar is starting to show cracks and given our budget deficits and pending financial obligations like Social Security and Medicare, those cracks could grow. Also, a number of momentum traders have suddenly turned bullish on the idea of oil again. This sets up for another potential run in oil prices. I'm not a believer that oil can run too far in an extremely weak economic environment, but as we saw last year, reality and perception can separate for extended periods of time. Also, while you will hear pundits talk about $3 gas or $3.50 gas as if it's not a big issue, remember that last year when gas was $4/gallon the national unemployment rate was 5.9%. We're almost 50% higher than that now and $3-$3.50 gas will in fact be a significant drag on the economy if it comes to fruition. I admit that I was first in line to beat up the media over their breathless swine flu coverage. I never got the flu, but I was certainly sick of the scrolling headlines of "Woman in Boston with flu-like symptoms", "School closed 6-8 weeks because a child vomited last night. ", etc, etc. However, it seems like we've turned the page a bit too quickly. Consider the following charts - 1) via The Disciplined Investor blog shows deaths (red line) and confirmed global cases of swine flu (I don't work for the pork industry so it will always be swine flu to me). What's particularly interesting is that the number of cases have almost doubled in the last four days, but no one seems to care. I'm happy to hear that this is not a terribly dangerous version of the flu, but it seems like we should take note of what appears to be a growing pandemic not a fading one. If this virus figures out a way to hook up with the tamiflu resistant version or the Asian bird flu then we might really have an issue. According to Google Trends, earlier this week more people searched for the term "American idol" than "swine flu". Thus, the nature order of the world have been restored. If you make $50k and spend $100k what do you think your credit score would be? That is in effect what the Federal Government's income statement looks like for 2009. Spending $2 for every $1 they bring in. If the Fed's called up Capital One right now they'd be looking at a 24.99% interest rate. Today the White House budget office projected a $1.8 trillion deficit for 2009 (I prefer to say eighteen hundred billion because other than astrophysicists no one can grasp what a trillion $ is). As I've said before the government is getting hit by a double whammy - falling revenues from lower tax receipts (fewer people working, fewer capital gains, falling corporate income tax receipts) and skyrocketing expenditures. What is particularly unnerving is that the White House forecasts include a fairly optimistic snap-back recovery in the second half of 2009. However, off-the-record there have been indications that the White House has been telling global leaders that it looks like things might not recover until 2011. In a recent tour of the globe trying to gain support for more financial investment the Obama administration has been stiffed by many potential investors. I think this could be the beginning of a long-term shift in global asset allocations away from the US toward emerging economies in Asia. We won't know how this plays out for 5-10 years, but it will be interesting to watch. My current long-range forecast is for more sputtering of the US economy in 2009 and 2010 with the stimulus perking things up in 2011 (2011 could be a stellar year for the stock market if things play out right). However, after that I think we'll settle back in for another 5-6 years of tough sledding. People are talking about the Japan's lost decade (which is really like 2 lost decades) - we could be looking at the same scenario here in the US. The interesting aspect of this chart is that it shows spending as a % of GDP tumbling but that is really a function of China's explosive GDP growth. However, given that their GDP has exploded it is remarkable that their savings as a % of GDP has been able to nearly DOUBLE. Lost among all of the gloom and doom talk about the trouble in the global economy is the fact that we're seeing an amazing shift in the ability of the informed public to decipher data at lightning speed and avoid the spin that is put on data. By about 8:38am on Friday, the BLS employment survey had been sliced and diced by various bloggers. As the stress test data was released it's become more clear that the stress tests are seriously insufficient and the banks were able to twist the Fed's arm. This is the sort of info that would have come out in a Congressional hearing 5 years after the fact back in the 80's. This info was out by Friday night in the internet era. Hopefully this is the last time we'll have to talk about the stress tests for awhile, but here goes. 1) The Treasury and the Fed Reserve hope that strong banks will have liabilities to "tier 1 capital" at a ratio of 25 to 1. Back in the sane old days, banks were required to have leverage not exceeding 12 to 1. These rules were relaxed in 2004 and banks went to 40 to 1 in a heartbeat. Now if we can get banks back to owing $25 for every dollar of capital we'll be ok. Sheesh. "The Federal Reserve significantly scaled back the size of the capital hole facing some of the nation’s biggest banks shortly before concluding its stress tests, following two weeks of intense bargaining. In addition, according to bank and government officials, the Fed used a different measurement of bank-capital levels than analysts and investors had been expecting, resulting in much smaller capital deficits. . .
For example Bank of America's capital need went from $50 bil to $34 bil and Citigroup's went from $35 bil to $5.5 bil. "But if unemployment breaches 10 percent, as many economists predict, the rate of uncollectible balances at some banks could far exceed that level. At American Express and Capitol One Financial, around 20 percent of the credit card balances are expected to go bad over this year and next, according to stress test results. At Bank of America, Citigroup and JPMorgan Chase, about 23 percent of card loans are expected to sour. Even the government’s grim projections may vastly understate the size of the banks’ credit card troubles. According to estimates by Oliver Wyman, a management consulting firm, card losses at the nation’s biggest banks could reach $141.5 billion by 2010 if the regulators’ loss rate was applied to their entire credit card business. It could top $186 billion for the entire credit card industry. What is more, the peak unemployment level that regulators used to drive their loss estimates is roughly what current rates are on track to reach. That suggests that if the unemployment rate gets much worse, credit card losses could be worse than what regulators projected." As expected the jobs report was bad but "less bad" in the headline number so people might be initially upbeat, but the details of this report are actually quite scary. 1) Revisions subtracted 66k jobs from last months jobs report, meaning that last months data was actually 10% worse than reported. Expect this trend to continue. 2) The greatest area of hiring? The public sector as the Census bureau began hiring 140,000 temporary workers to work on the census. One of the problems with the jobs report is that it doesn't weight the jobs by economic contribution. One lawyer laid off from a Wall Street firm might have a salary of $400k while 10 part-time census workers might make half of that amount. The Labor department however views 10 low paying jobs as 10 times as good a 1 high paying job. This has been a problem for many years as high-tech and skilled manufacturing jobs shifted overseas and they have been replaced by Temporary help and Services (Restaurant, Retail) jobs in the jobs report. To the Bureau of labor statistics a job is a job, but to the unemployed GM worker busing tables at Friday's I think they may feel differently. 3) Our favorite the Birth/Death model is Laugh Out Loud bad this month. For many years, the Birth/Death model (which "guesstimates" the number of jobs created at new companies that the government thinks are out there, they just can't find them yet) has been the plug to fill gaps in the economy. I was hopeful that this process would end with a new administration, but I was wrong. * 38,000 new jobs were created in Construction. A total of 225,000 phantom jobs were added to this report (up from 114k jobs last month) because some statistician decided that would be the number that would make the headline "less bad". I'd argue that in fact, very few new businesses are opening and we should be showing a negative number in this category as the number of small businesses going out of business exceeds the number of new businesses starting. Just for arguments sake subtract the 225k Birth/Death jobs from this report and you have a startlingly bad 750k jobs lost this month. I think that smart people can see through this smoke screen and lots of big money players are starting to shift to the short side. The futures are up sharply we'll see if it lasts. Well, given the consistent leaks during the week there was less suspense in the stress test results than watching a Seinfeld rerun for 114th time. Banks are going to need more capital. No surprise there. The government can fix many of the rations that concern them by converting preferred equity to common equity. This another accounting gimmick to make the banks look healthier than they are. The biggest problem with the stress test is that, well its just wasn't very stressful. 1) The ADP data is just plain bad. When they showed 700k jobs lost in March everyone said "jobs are a lagging indicator", but when they show 500k jobs lost it becomes a green shoot. Having your cake and eating it too. ADP has historically been a terrible predictor of the monthly jobs data. Estimates for tomorrow are all over the board, but given the statistical variations that can move this data, I expect the number to be "less bad" than feared. I'll try to provide a quick read of the data tomorrow morning. 2) The economy needs to add 150k jobs a month just to keep pace with population growth. Anything under that number and the unemployment rate grows. Even if you buy the ADP data, I think it's clear that unemployment will continue to trend upward if we're 650k jobs underwater this month. I had a pull my hair out of my head moment tonight. Whose your daddy? Goldman Sachs. There remains a decidedly positive bias in the market and the media's interpretation of data. Including this story Where Home Prices Crashed, Signs of a Rebound which is not quite as rosy as the headline would indicate. As I've said, home sales might show some slight reversal in very depressed and low-end markets, but those are unit sales. Prices remain depressed and when people talk about the how the housing market fueled the economy over the past 5 years, they aren't talking about $73,000 fixer-uppers in Clayton. The person that bought a $400,000 house in San Francisco that they sold for $1.1 million was suddenly flush with cash and able to fuel the economy (even if their house was never really worth more than $400k). "Sales volume tends to recover long before prices. In fact, some analysts think price declines in many markets are accelerating. First American CoreLogic, a real estate data firm, reported that “the depth and breadth of price declines continued to worsen in February.” Fitch Ratings recently revised its estimate of future declines to 12.5 percent, from 10 percent, saying the drop would extend to the end of next year. . .
A true recovery in housing can not exist in an environment of a shrinking workforce. This recession has been so devastating and so swift that it's left many observers looking like "Survivorman" after a week in the Australian outback. People are so delirious from the bad news that any bit of data can be twisted to fit a positive thesis. "Embattled insurer American International Group paid some $454 million in previously undisclosed performance bonuses to employees for 2008, the company said in answers to questions from a U.S. lawmaker that released on Tuesday. AIG was widely criticized for paying out some $165 million in retention bonuses after it received some $180 billion in government bailout aid. Some of the retention bonuses were returned by employees after the firestorm of criticism. Payments ranged from an average of $5,403 to employees of its property-casualty group, to $51,026 on average for those in its asset management group. The payments are in addition to an about $120 million corporate bonus pool designated for holding company employees and executives at subsidiary companies." "existing GM common stockholders would hold approximately 1% of the pro forma outstanding GM common stock." Thus, the stock that is currently trading at $1.85 is ultimately worth a little less than $0.02 per share. Now stocks can and will trade irrationally for some time, but it seems like unless this plan is completely dead on arrival, the stock you see trading under the symbol GM is going to start a steady march toward zero. Wait, you mean the banks are struggling to meet the fake stress test? Another night, another leak. Tonight the news is that 10 of the 19 banks facing the "stress tests" will be forced to raise more capital. Shocking (please note the sarcasm in my tone). What is really shocking is that banks are failing a poorly designed test that was built for them to pass. However, here's my real issue - about 2 months ago Citibank and Wells Fargo kick started this current rally by saying that they were profitable and things looked great. Well, the problem that I noted at the time is that they were talking about their operations, not mentioning losses on existing assets. This is kind of like saying your kid is at the top of their class, but forgetting to mention that he's only passing gym. Citibank, Wells Fargo and the rest of the banksters knew they were going to need to raise more capital back in March. Since that time these stocks have been world class home runs. Citi has gone from $1 to $3. It doesn't sound like much but that's about a 1200% annual return. Let's say Citi was told to raise $10 billion with a $1 stock. That means 10 billion new shares and they'd be approaching Hackett's territory :). Now if they need to raise $10 billion they'll "only" have to issue 3 billion shares. Wow, it's a good thing someone leaked that news about how good business was to boost Citigroup's stock.......oh, wait wasn't it Citigroup that leaked the news? The markets soared on no real news again. This was very strange action and some have said their is evidence of market manipulation going on (the way the market gaps open and then pins is very suspicious, but until I see some hard evidence I won't buy it). Also, as I've noted before almost 40% of the most moves in the market in the last 2 days occurred in the final 5 minutes of each day because of the use of ETF's. This is not natural and not an indicator of real strength. The markets again broke through technical barriers and are looking for another push up to 925-950 on the S&P 500. While it's fun to talk about the "rally of 2009" it's important to note that after this historic 8 week rise, we are ALL THE WAY BACK TO WHERE WE STARTED 2009. If you live within your means, you can be a saver. Savers also have natural budgetary skills and the ability to shop wisely. If you are able to save 12 months of expenses you will be more able to tolerate the unavoidable financial pitfalls that will one day come your way. 2.) Learn to read the fine print. Every salesman will gloss over the contract for your flashy new phone, car or health club membership. Ask to take a copy of any proposed contract home first. Read it in it's entirety before signing. That 1 day pause might actually cause you to rethink the need for a $75/mth cell phone or you might happen to notice the $175 early termination fee hidden in line 31 of page 15. Perhaps the single greatest problem with every financial agreement - car loan, mortgage, etc - is that too many people focus on their monthly payment. Can I afford the home if I make X? Sure, let's just make that an interest-only loan with payments over 40 years and an 80% balloon payment in year 40. The point being, that I can create any "payment" to match your income stream. Your job as a financially astute consumer is to ignore all of that white noise and focus on the price and only the price. "Some lenders may encourage grads to consolidate and stretch out their students loans, paying them off over 20 years instead of 10 to lower the monthly payment. Repaying $10,000 in 6.8% loans over 20 years will cut the monthly payment to $76.33 from $115.08. But it will also more than double the interest paid -- and your payments will total about $18,300, instead of $13,800." 4.) Debt is the great divide. Debt is the single greatest threat to you new graduate's financial future. Credit card companies will be offering freebies at every corner when they role onto campus in the fall. While debt has its place in our society it can quickly put a new graduate behind the financial eight ball. 5.) Don't rush out and buy that new car. This is a little subjective and frankly, it's probably never been a better buyers market for autos. However, I'm a big believer in letting the original owner take the depreciation hit. If you need reliable transportation, consider a high quality, low mileage, pre-owned vehicle. The vast majority of buying interest has come from two sources - short covering and aggressive momentum traders. Momentum traders trade the direction of the market and don't care whether the market's up or down as long as it's moving. As of late, the move has been up and they've been long, but that trend can reverse itself just as quickly. With the 24-news cycle running amok with "all swine flu, all the time" headlines it's important to get a little perspective on what this pandemic looks like in a historical perspective. The image is difficult to read in blogger - so you can check out the original at this website. The two take aways from this map - the 1918 Spanish flu was a serious pandemic. 20 to 50 million deaths worldwide and up to 18% of the world was infected with this flu - those are panic worthy stats. After the bird flu and SARS scares during the last decade, there have been numerous health department efforts to develop pandemic game plans. The H1N1 outbreak has been the first opportunity for many to institute their fancy "pandemic plans" that have been gathering dust. Thankfully, it looks like these plans are working right now. However, I think it's worth noting that this doesn't appear to be "the big one". I hope that health officials don't suffer from hurricane forecaster's "crying wolf" syndrome (evacuating Florida for a pending a Cat-5 hurricane that turns out to be a breezy thunderstorm), because if they do, there could be a Katrina-style flu in our future.